Cristiano Ronaldo believes Liverpool sensation Mohamed Salah is a genuine contender to break his and Lionel Messi’s decade-long dominance of the Ballon d’Or. Salah enjoyed a stunning debut season at Anfield, scooping up the Premier League Golden Boot en route to netting 44 goals in all competitions. 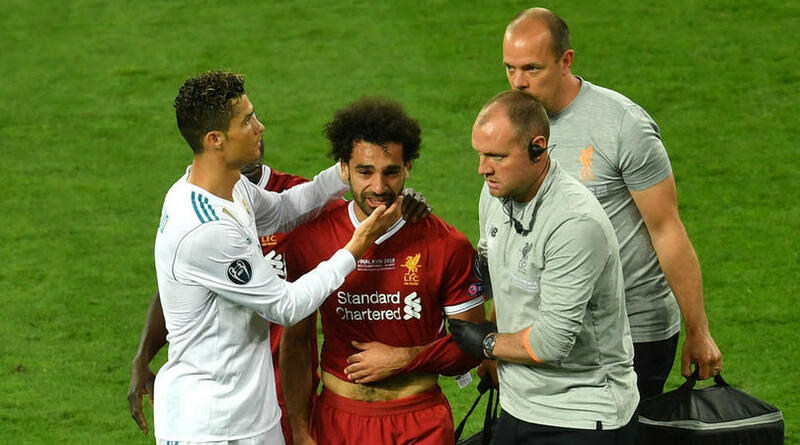 His sparkling form underpinned the Reds’ surge to a surprise Champions League final appearance against Ronaldo’s Real Madrid, but the fairytale ended in tears as a shoulder injury forced him out in the early stages of the 3-1 defeat in Kiev. Ronaldo, who has shared five Ballons d’Or apiece with Messi since 2008, hopes the Egypt international will be fit to prove his class at the World Cup. ‘Salah has been one of the revelations of the year,’ Ronaldo told reporters. ‘I hope his injury in the final in Kiev doesn’t keep him out. The 33-year-old admits a tough Group B opener against Spain on 15 June is not ideal, but he remains confident the European champions will reach the knockout rounds. ‘A defeat on the first day puts you in a bad way for the rest of the tournament so it’s important to start well,’ he said. ‘But I believe both Spain and Portugal will reach the next round.